It’s no secret that the National League for Democracy (NLD) faces myriad challenges in improving Myanmar’s socioeconomic situation. In fact, its biggest challenge might be deciding which issues to address first. Led by Nobel Laureate Aung San Suu Kyi, the NLD has made the peace process, which is aimed at ending decades of strife between the military and Ethnic Armed Groups (EAGs), a priority for the government. Other challenges include how to resolve the religious strife in Rakhine State, finding a way forward with the Myitsone Dam project, and possibly most importantly, how to light a spark under the economy. Jobs and the economy affect all citizens of Myanmar, from the dense forests of northern Kachin State all the way down to the tropical beaches of southern Thaninthayi Region. Foreign investment in the economy is crucial to capitalizing on Myanmar’s immense promise. It has cheap labor, abundant natural resources, and a vast potential for energy generation. One major factor that it currently lacks, which is crucial for foreign investment and economic development, is a comprehensive and reliable national electrical grid. According to the Asian Development Bank (ADB), only 30 percent of households in Myanmar are connected to the power grid. The proportion is higher in urban centers such as Mandalay and Yangon, while only about 14 percent of rural residents have access to electricity. According to the UN Development Program (UNDP), in 2014, 26 percent of Burmese lived in poverty. This figure is significantly higher in rural areas, where economic despair is exacerbated by a lack of access to the power grid. Providing access to electricity is a straightforward way to allow small villages in remote locations to thrive and become more productive. Students will be able to study for longer, power tools will make labor more efficient, and it will be a first step toward connecting remote population centers to the internet. A stable power supply is also essential for foreign direct investment (FDI), which can generate new employment opportunities for a young population hungry for jobs. In addition to outside investment, an improvement in the electrical infrastructure will allow domestic firms to establish operations in more remote areas of the country. But there is much progress to be made. As of 2016, even in the commercial capital Yangon, blackouts are a regular occurrence. After a few seconds of darkness, back-up generators will hum to life in upscale shopping malls like Yangon’s Myanmar Plaza, diplomatic compounds, and restaurants popular with tourists. But the vast majority of the population, if they even have access to electricity, must simply wait for the power to return. Fortunately, many foreign companies are eager to help Myanmar upgrade its electrical infrastructure. In Yangon, firms like Prime Energy are aiding the Yangon Electricity Supply Corporation to better utilize the electrical infrastructure already in place by making it more efficient and mitigating energy loss. Technology for managing an electrical grid, such as the Supervisory Control and Data Acquisition (SCADA) system, though commonplace across the world, has yet to be implemented in Yangon. Doing so could drastically improve energy management in the city, and the technology could be transferred to other parts of Myanmar once tested in the commercial capital. More efficient power lines, electrical box monitors, and curbing illegal hook ups to the grid could also help improve efficiency. Fortunately, Myanmar’s leaders are not lacking in plans for the future. In 2015, the previous government initiated a plan called the Myanmar National Electrification Plan, which aims to provide universal access to electricity by 2030. This framework will provide reassurances to investors, who will be reasonably able to assume that if they make an investments in Myanmar, the electrical power grid will continue to improve. Foreign corporations, seeing increased energy reliability in Myanmar being in their own business interests, might even be willing to contribute to the $6 billion that the plan is expected to cost. The government of Myanmar could seek loans from the World Bank, IMF, the ADB, and even the new Asian Infrastructure Investment Bank (AIIB). Another factor adding credibility to the National Electrification Plan is that this roadmap has been proven successful in other places in Southeast Asia. Vietnam, Thailand, and Laos all increased electricity access from around 30 percent to nearly 100 percent within two decades. The plan’s objective is to expand the current grid outward from its centers in Mandalay and Yangon while simultaneously setting up small, off-grid power generation facilities in remote locations. These smaller power grids can provide electricity in the interim and will eventually be connected to the main power network as it spreads its roots outward. These off-grid power generation facilities have the added benefit of providing a quick power supply to remote areas that are primarily inhabited by ethnic minority groups — many of which have had a tumultuous history with the central government. If these power stations can provide reliable electricity in remote areas, it will allow local communities to improve their own economic situations as well as pave the way for domestic and foreign investments. Remote areas in Kachin and Shan States, in the north and east respectively, have vast natural resource deposits and hydropower generation potential. With better power grid access, it will be easier for local governments to exploit these resources as well as diversify into other economic sectors that can create new employment opportunities, such as in manufacturing and tourism. Economic development could help to remedy the drug pandemic, but basic infrastructure, such as roads, clean water, and a supply of electricity are all prerequisites to developing rural areas. Kachin State is also very dependent upon the jade trade, which has been linked to former military leaders and tycoons. Economic development in these areas could provide more reliable jobs that will allow the jade trade to be better regulated and the growing of poppies to be curtailed. Expanding the electrical grid to give these areas access to electricity is part and parcel of diversifying local economies and reducing the population’s dependence on the jade and drug trades. Expanding the power grid is not an end in itself but is requisite to further economic progress. Another issue standing in the way of developing the grid is the bureaucratic reshuffle that occurred in March. Upon coming to office, President Htin Kyaw announced that the government would reduce the number of ministries from 36 to 21. As a result, the Ministry of Electric Power and the Ministry of Energy have been merged into the Ministry of Electricity and Energy under the leadership of Permanent Secretary U Htain Lwin. The minister has plenty of experience in this field, having previously been the head of the Ministry for Electric Power before the merger. However, he still must work out how to integrate these two previously autonomous organizations to ensure continuity and productivity. Myanmar is also well-known for exporting energy, but not without controversy. The massive Myitsone Dam project would have sent 90 percent of its electricity into China’s Yunnan Province, while keeping only 10 percent in Myanmar. Myitsone was plagued with questions on how much it would benefit locals, many of whom were relocated to new settlements to make way for the dam’s reservoir. The project was canceled by the Thein Sein government in 2011 due to protests from the local population in Kachin State as well as among many citizens across the nation. Thailand has also been active in Myanmar’s energy market, but typically with less controversy. On July 18, Thailand’s Siamgas and Petrochemicals Company invested $48 million into a 230-megawatt gas-fired power plant in Mawlamyine Township. 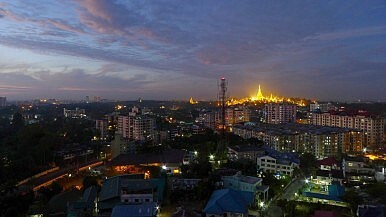 Myanmar has all the right ingredients for economic success. It possesses an abundance of young, cheap labor, immense natural resources, and is viewed by many investors as the last frontier economy in Asia, due to its isolationist posture prior to 2011. The NLD faces numerous socioeconomic challenges, and is under pressure to show results to the population. The government in Naypyidaw doesn’t have deep pockets, and raising taxes abruptly to fund infrastructure projects won’t be very successful in a nation where the average per capita GDP was only $1,203 in 2015. Instead, Naypyidaw should appeal to outside nations such as China, Japan, Singapore, and Thailand, as well as international financial institutions such as the ADB and AIIB, for funding and expertise. Accelerating the National Electrification Plan and increasing its budget would provide short as well as long-term economic dividends, and demonstrate that the government is serious about doing all in its power to ensure that Myanmar is ready for foreign investment. Peter Loftus is a master’s student at the Johns Hopkins School of Advanced International Studies. After a few rocky years, China is building up ties with Myanmar's new government.